March was a super fun month with James’ 8th birthday followed by Spring Break. 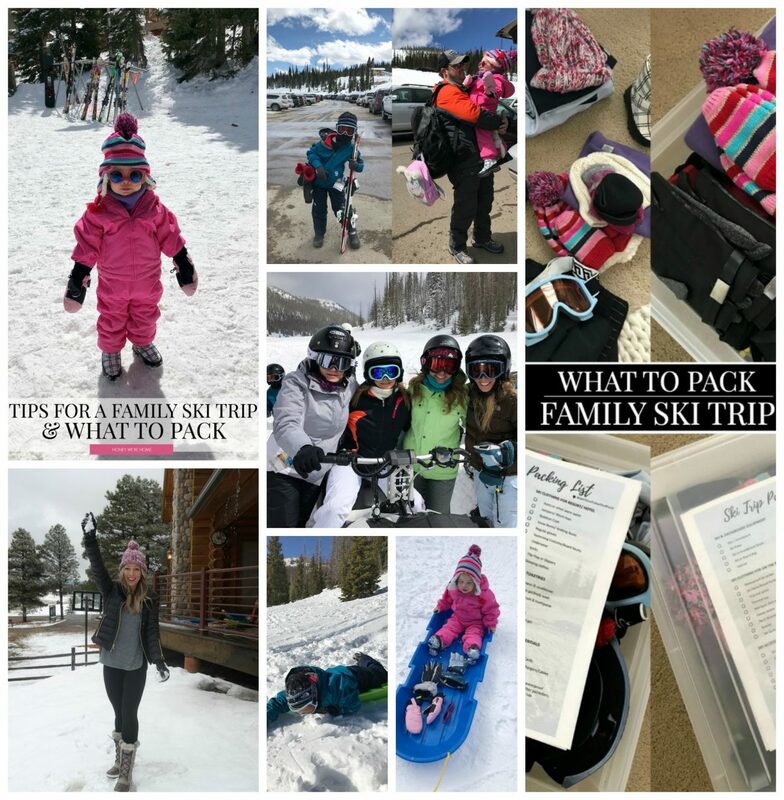 I’m so glad the Tips for Family Ski Trip were helpful! These kinds of trips will definitely get easier as Jordan gets older, but I will always cherish the memories of her first time in the snow! I mentioned earlier this week that I’m working with Kendra Scott as a brand ambassador for her Spring & Summer collections. #dreamjob #pinchme! I’ve gotten to sample some of the gorgeous pieces, so I wanted to share them with you here. 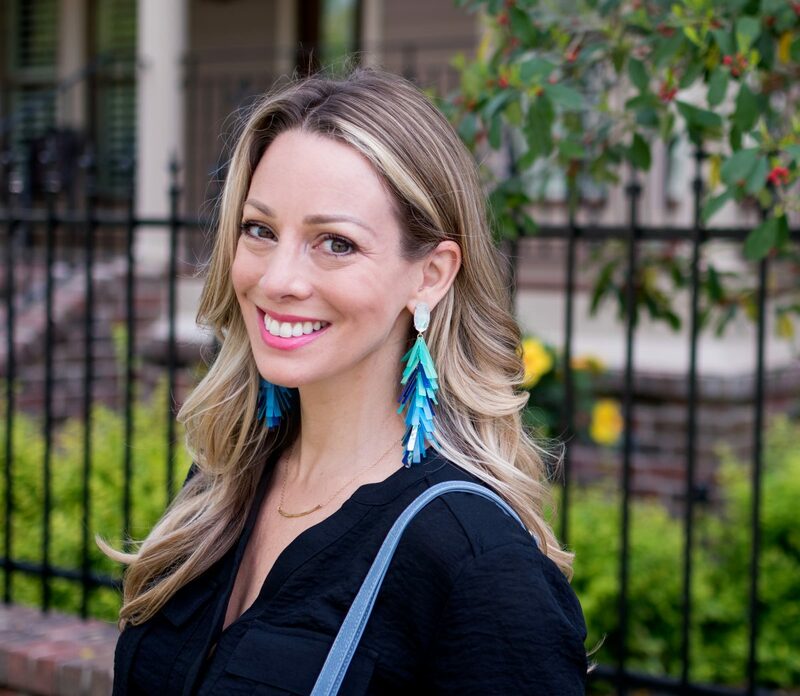 You may have seen these darling aqua tassel drop earrings on my Instagram recently. I’ve been making a point to post more of my everyday outfits there, so definitely follow me if you aren’t already. You can also subscribe to my newsletter here so you never miss a post, and you’ll also get the HWH Weekend edition, where I share sneak peeks of what’s coming up next, healthy recipes, my style faves, and the #1 thing my readers are loving each week! Of course the ‘selfie arm’ above didn’t give you a look at the coordinating bracelets! 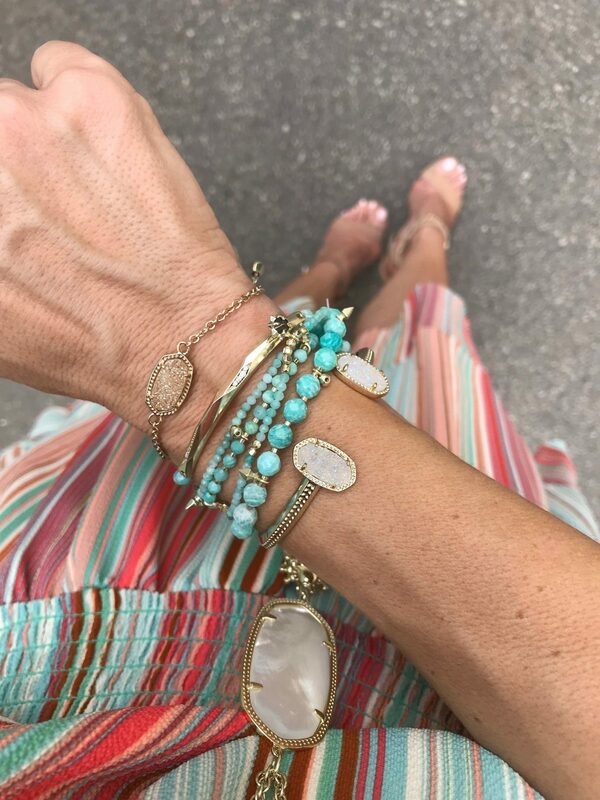 I’m a fan of aqua, but they come in a bright rainbow of colors, so you’ll be able to pick your fave based on what looks best on you or what coordinates with your wardrobe. I was so happy to see the anklet making a comeback! Did it ever leave? 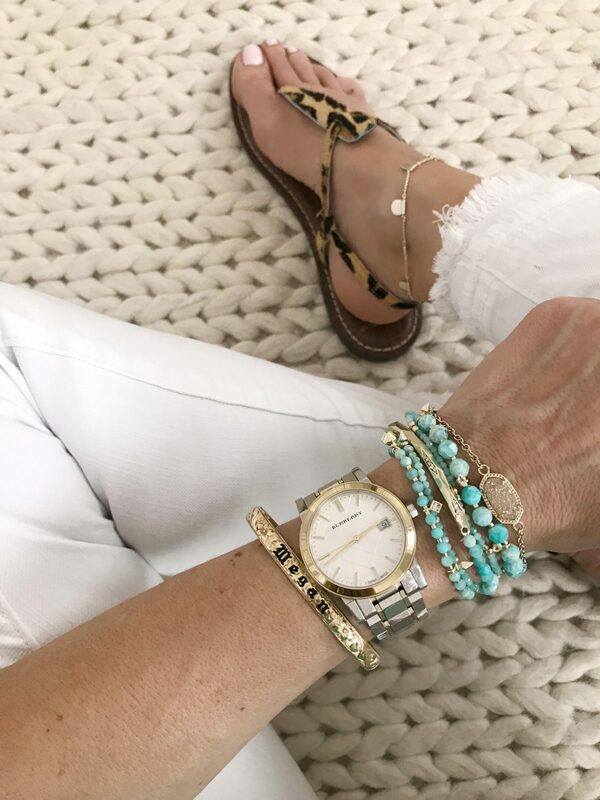 Especially during the summer, I love how a delicate anklet dresses up your foot! This one has a couple places you can clasp it so it’s not too loose or tight. And how cute are the leopard sandals?! That tiny pop of leopard is all you need to add some oomph to your outfit! 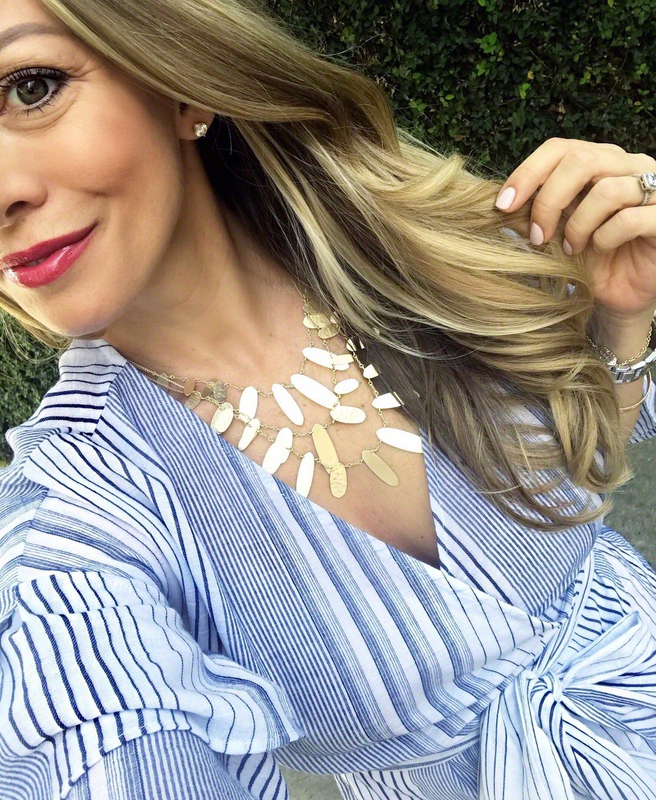 I also fell in love with the Kendra Scott layered gold necklace. It’s hard to tell from the glare of the sun, but it’s a combination of both smooth and hammered gold pieces. And how about these va va voom drop earrings?! Man, I feel so fancy in these! I don’t typically wear something this long, but I love the pop they give! You will get tons of compliments and questions about these babies if you wear them to a party. March was a bustling month on the blog too! 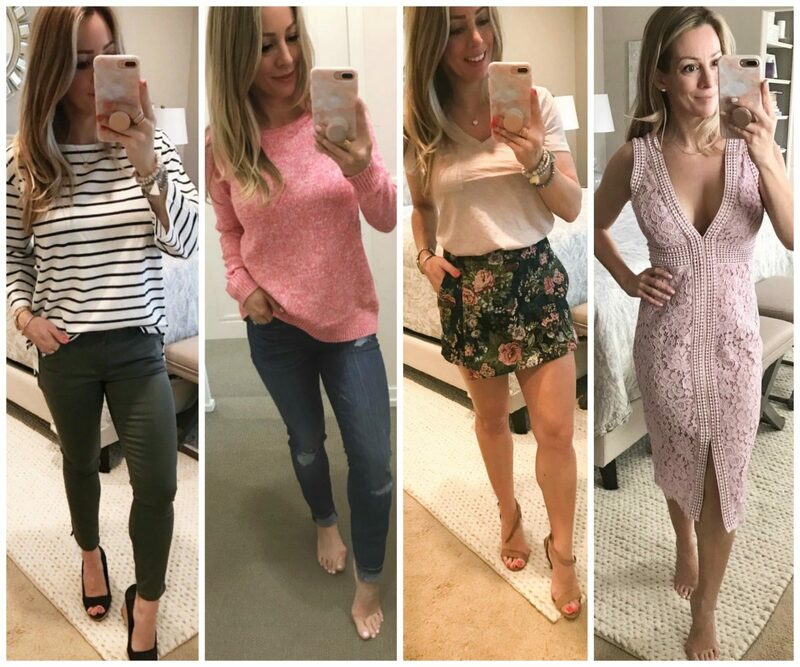 We started out with a Dressing Room post, where I try on lots of cute, new styles for you and give you the low down on quality, fit and style tips. 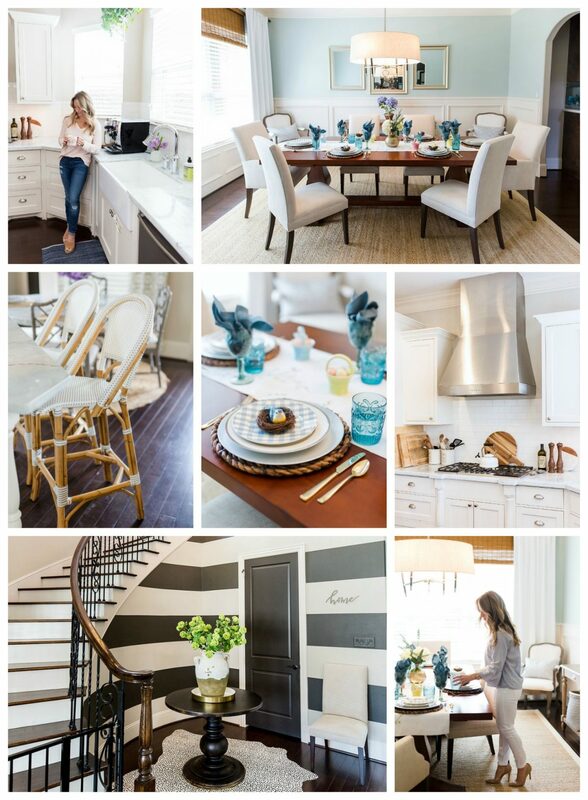 On the home front, I decorated the house for Spring and showed y’all around in the Decked & Styled Spring Home Tour with several of my girlfriends. Of course, I had to include a pic of my beloved coffee & creamer! The post has links to everything if you want to see where something is from. 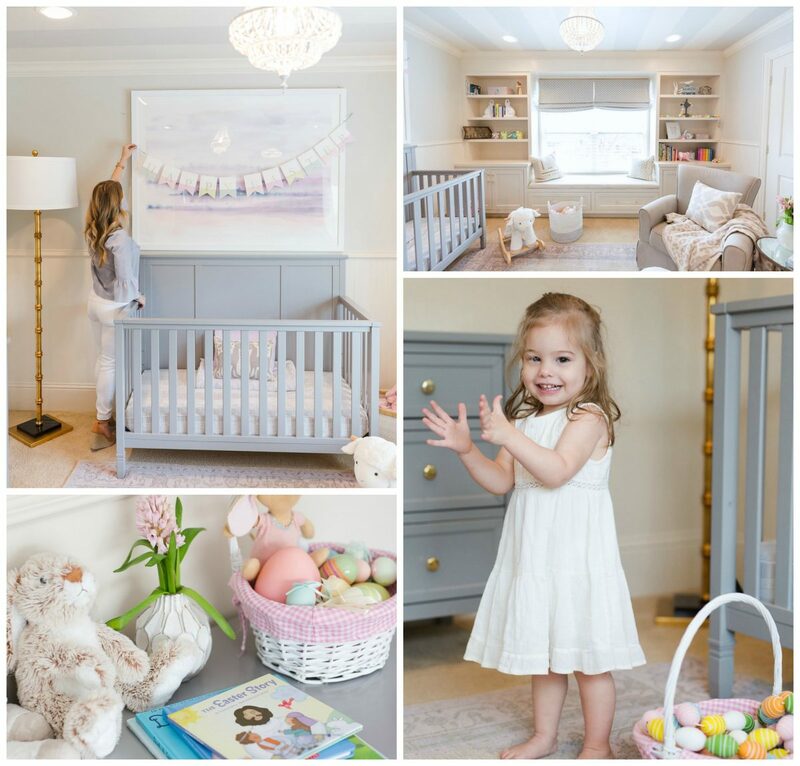 I also added some Spring touches to Jordan’s nursery! She’s growing so much everyday and now we’re at the point where we have legit conversations! It’s amazing!! Lots of you have been asking me to share how I do my makeup everyday, so I did a step by step makeup tutorial for you here. It doesn’t take long, but always makes me feel so much more put together for the day! Then, I then turned around and glammed it up for a night out!! A few extra steps and some contouring make a world of difference! I’m so thankful for this lash serum for saving my lashes when I nearly lost them from pulling out my lash extensions. You just apply it to the base line of your lashes at night. There’s no order or irritation and it goes on clear. After several weeks, you’ll notice visibly longer lashes! Thank God! I thought I had ruined mine forever! 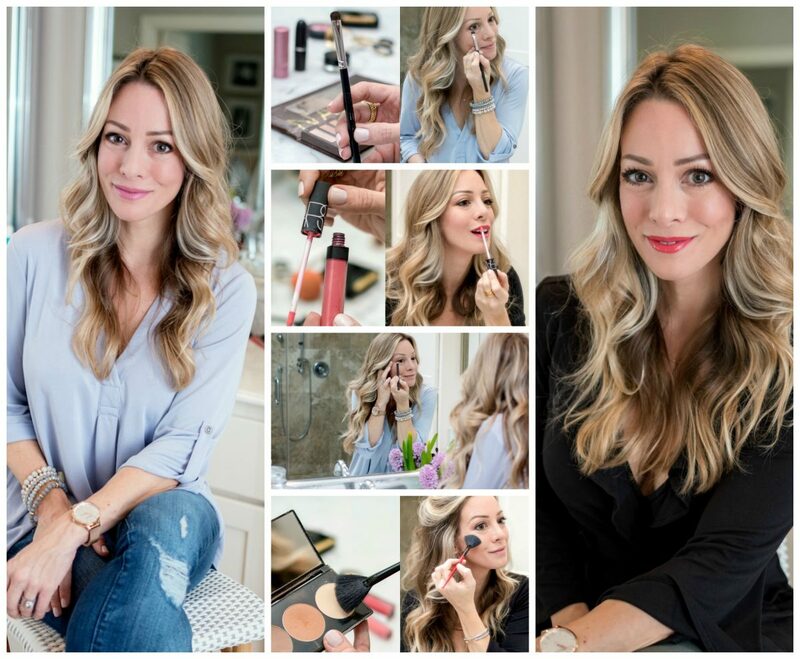 Next month, I’ll be sharing my morning beauty routine with you! Ever since entering my 40s #whos40?! I’ve started taking my skincare more seriously. One of your favorite series’ around here is Monthly Loves! My March Loves featured some amazing finds, must-haves and re-stocks!! The springy tassel necklace is back in stock after a brief moment of selling out! #phew! My jean shorts are coming back in full rotation as our weather heats up! They are my fave because they are perfectly slouchy (but don’t look too sloppy) with just enough distressing, darker wash, and a comfortable fit. I sized down 1 to a 24 in them. I got a spray tan… then did some swimsuit try-ons and fit reviews! I tried on a ton of suits (one-pieces and bikinis) to get you all ready for Spring Break! I don’t think swimsuit shopping is anyone’s favorite thing, but I hope seeing these suits on helps when deciding which one is right for you. Back into real clothes to share some Spring dresses!! First up were the eyelet dresses perfect for this time of year. Next, I took it up a notch with some ruffles!! This cute little striped shirt dress, I originally shared in a Dressing Room post and I knew right away it was a winner! I got mine at Nordstrom, but sizes are limited there, so it’s also available in more sizes and colors here! March’s This & That post focused on my Nightly Cleaning Routine and My Recipe Binder. I love that you guys enjoy this type of content here too because it’s all part of my real life! I started following How Jen Does It for cleaning/organizing/meal planning tips and started using Grove Collaborative to purchase cleaner, safer products for my home! I also shared my obsession with my new cordless Dyson stick vacuum!! It’s seriously been life-changing in the most possible non-dramatic way! I mean, if you could’ve seen all the messes and crumbs and food on our floor under the barstools where my kids often eat, you’d know why! Also don’t miss a couple good #dressingroomdetails for Spring inspiration! Last year I read The Miracle Morning and started incorporating the practice into my daily routine. The reason this Miracle Morning routine is so important is that without it, I feel like I just go, go, go without any time for self-reflection or planning or self growth. Touching base with yourself is critical to our self care and well-being. The goal of the Miracle Morning is to wake up each day with more energy, motivation and focus to take your life to the next level. I started a new series this month featuring one hero piece and giving you ideas for how to wear that one item at the office, on the weekend and for date night (wow)! 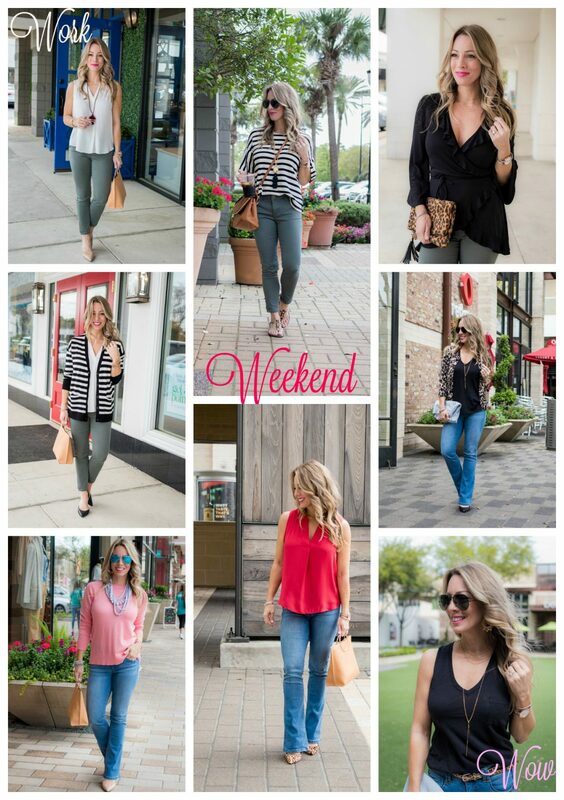 I started off with the versatile crop skimmer jeans and then these amazing bootcut jeans that not only give you legs for days, they tame your tummy! I’m living for the weekend these days- I love spending time with the kids and all of James’ activities and the fun spring stuff that happens in Houston!! I dedicated a whole post to some fun weekend styles featuring pieces from the Living in Yellow x Gibson collection! How sassy is that dress?! But it’s soft and jammies! I found the most amazing, super soft, cuddly, cozy, light, did I say amazing sheets for our bed (flat sheet & fitted sheet)!! 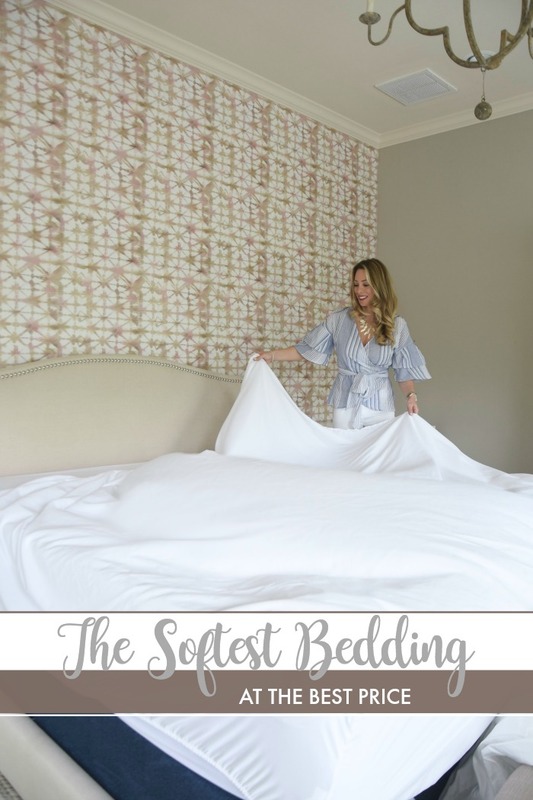 I highlighted those and other awesome finds from the eBay Spring bedding event in an update on our Master Bedroom Remodel! For Spring Break, we escaped to Pagosa Springs, Colorado with 17 of our closest friends. It was our first airplane trip with Jordan and both kids’ first time in this much snow. I put together a recap of our quick getaway and shared some tips for packing and traveling with a toddler! As always, I genuinely thank you for being here and sharing in our life and style here on the blog! I hope you have an amazing weekend and a wonderful Easter celebration with your families! My picks: Picturing this cami with all sorts of colored denim and shorts! My picks: Some really cute dresses: pleated midi, hot pink keyhole dress and this polka dot wrap dress. MADEWELL • Free shipping for Madewell Insiders! My picks: This pleated tank is under $20! This tie-front tee is 20% off. My picks: I can think of a ton of outfits with this button up! I probably need this #givemeallthegingham clutch! OLD NAVY • Entire store on sale up to 50%! My picks: This off the shoulder shirt comes in 5 colors and check here for cute, inexpensive swim! COLLEEN ROTHSCHILD • Save up to 25% depending on how much you spend! All orders over $49 get free shipping. I’m smitten with those too! Love the color! I didn’t see a link to the dress you are wearing in the first picture? I LOVE it! Oops! Just added the link! It’s from JCPenney! I’ve been following your blog for a couple of years now and want to say thanks for all of your posts – they are helpful, inspiring and fun to read. Thanks again! Lisa! That is such a wonderful comment! I want to you know how much it means to me! Thank you! Love your month’s rewind. I may have mentioned this before but it needs to be repeated. You have beautiful luscious lips. Thanks so much for that Sue! It’s the best feeling to know that you appreciate the work I put into my blog! Have a wonderful Easter weekend! Hi! Random question, where is that glass spray bottle from in your cleaning supply picture? Love the yellow purse! I don’t see a link for it. Here ya go! I’m not sure it’s available anymore! The Dyson cordless is TRULY the best. Inspired to full organize the recipe binder. I love your taste, everything looks cute on you. I can’t believe how much I’m in love with a vacuum! But I’m sure you agree! !